Bike lights are so old school. 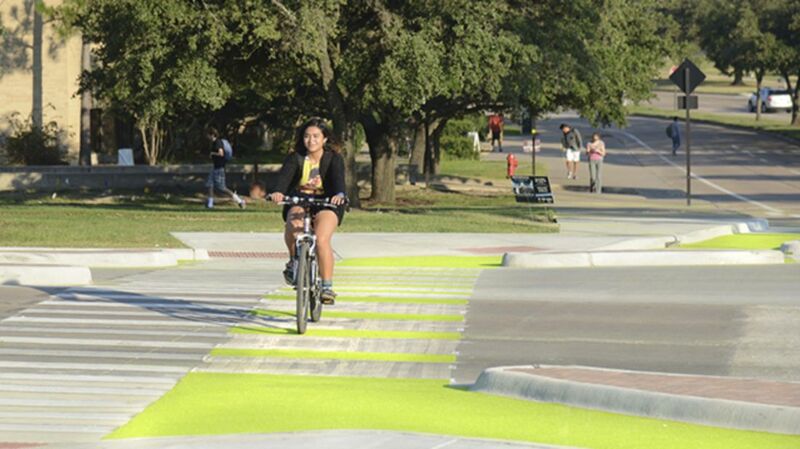 At Texas A&M, the latest bike-safety innovation does one better—the bike lanes glow. Solar-powered luminescent pavement markings soak up solar energy during the day, then emit light after the sun goes down. It’s the first time this technology has been used on U.S. streets, though other countries—most recently Poland—have been testing similar glowing bike lanes for some time. So far, the technology is only located at one intersection on campus, but presumably if it proves effective it could spread to other areas. Architecture and urban design students will be studying the new innovation's impact on traffic as part of their coursework. The intersection is already designed to be one of the safest possible for pedestrians and cyclists. It’s a Dutch junction, the holy grail of intersection design among urban planners because it separates cyclists and pedestrians from turning cars with an extra curb at each corner. The design is only used in a few places in the U.S, and this one is particularly rare, because it’s the first in the States not to feature any traffic signals, a technique that has been gaining traction in Europe for more than a decade. Engineers have found that fewer signs and signals can actually be a boon to road safety, since people slow down and pay more attention when traffic situations are more ambiguous and feel more dangerous. These kind of designs have been slow to catch on in the U.S., but they may one day spread beyond college campuses into a city near you.